No political event, big or small, exists in isolation. Every speech and gesture by a leader of consequence has a context, a subtext, a message(s) and portents that linger long after the dust raised by his chopper or motor cavalcade has settled. These elements often acquire a life of their own and augment the basic purpose of an event. Prime Minister Narendra Modi’s visit to the Kedarnath shrine and his address to a gathering there on October 20 and Uttar Pradesh chief minister Yogi Adityanath’s presence at the Ayodhya “Deeputsav” celebration on Diwali on October 19 have resonances that transcend the boundaries of the small towns and the states in which they are located. Both the occasions have to be contextualised in the backdrop of the elections in Gujarat and the BJP’s resurrection of its tried, tested and trusted Hindutva card that may not carry its original potency this time. Gujarat is beset with woes arising from the arrival of a Goods and Services Tax regime. It has compounded the problems faced by textile and diamond traders who are up against an overall economic downturn that slackened business, caused job losses and shutdowns. The state’s caste fault lines, camouflaged by a sense of “Hindu identity” in the years that the BJP has ruled, have surfaced as the dominant Patels or Patidars and the Thakores (divided into upper castes and backward castes) vie for a larger share of the power pie. Gujarat is beset with woes arising from the arrival of a Goods and Services Tax regime. After Modi’s relocation to the Centre, the BJP does not have a credible or charismatic face, capable of leading the party to another victory, independent of Modi’s persona and legacy. Modi’s immediate successor Anandiben Patel announced she will not contest the election. The incumbent chief minister Vijay Rupani, though not a hot-button, was regarded as “uninspiring” by the Gujarat BJP. Therefore, this circumstance increases the BJP’s dependency on Modi to deliver another victory with the party president Amit Shah as the back-up. Modi was Gujarat’s “Hindu hriday ka samrat” (monarch of the Hindu heart), an appellation he earned in 2002 on the back of the Godhra train carnage and the ensuing communal violence. He tried to balance the Hindutva tag with “vikas” (development), accounting for every little “accomplishment” of his government in his campaign trails. Modi was Gujarat’s “Hindu hriday ka samrat” (monarch of the Hindu heart), an appellation he earned in 2002 on the back of the Godhra train carnage and the ensuing communal violence. Modi has reasons to play the Hindu card with greater intensity this time. The Patels are upset with the BJP but the community’s also susceptible to faith-based political rhetoric and may not root with alacrity for the Congress. The traders must be retained, the upper caste Thakores have to be weaned from the Congress while the OBCs, a constituency the BJP has assiduously tapped into since 2012, may not vote for it as a solid block because the Congress is also making a play for their votes by co-opting non-state actors like Alpesh Thakore. The Dalits and the tribals vote differently in the different regions. Second, the Rashtriya Swayamsevak Sangh (RSS) and its affiliates like the Vishwa Hindu Parishad (VHP), that have a vast network, have to be assured that Modi’s heart is with the Hindus. In the past, as the chief minister, he had run-ins with the VHP and made no secret of his dislike for its state leader, the outspoken Praveen Togadia. Because Modi’s pro-Hindu credentials were above board, the VHP could do nothing to damage him and the BJP. Kedarnath, high up on Uttarakhand’s hills, was where Modi played to the Hindu gallery. His forehead covered with sandalwood paste and “rudraksha” beads strung around his neck, he invoked Shiva, enshrined in the temple’s sanctum sanctorum, seeking “Baba Kedar’s” blessings. He sent his greetings to Gujarat on its new year in Hindi and Gujarati several times. Modi claimed his political career was the outcome of a call from “Baba Kedar” to dedicate his life to the country’s 125 crore “Babas”. But the political underpinnings were unmistakeable. He wanted to remind people that in his youth, he had turned a monk and was wandering in the hills of Uttarakhand until he chanced upon an unnamed “ascetic” who counselled him to return to worldly life and “serve” people. This is mentioned in an early biography on Modi called “Narendra Modi: The Architect of a Modern State” by MV Kamath and Kalindi Randeri. It is a story that many Gujaratis swear by. Modi harked back to the flash floods of June 2013 that had flattened out the hills, alleging that as the Gujarat CM, he had wanted to help out the state but the Uttarakhand government (then helmed by Vijay Bahuguna who has since joined the BJP) had rebuffed his offer. Kedarnath, part of the “char dham” or four abodes of god, is a must on a devout Hindu’s pilgrimage. More so for Gujaratis who account for the bulk of the tourists with those from Tamil Nadu, Andhra and West Bengal. In 2013, several pilgrims from Gujarat were trapped in the deluge. 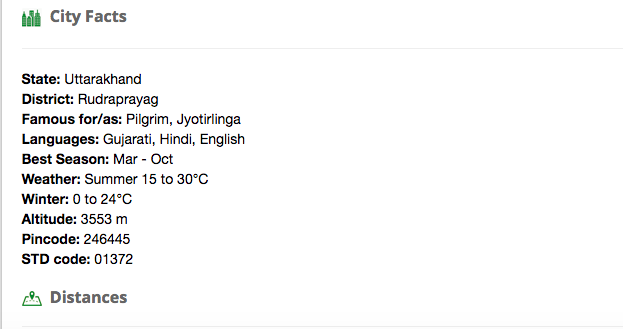 The Uttarakhand Tourism Development Board website, specifically mentions Gujarati among the three languages spoken in Kedarnath with Hindi and English. The Congress’s attempts to punch holes in Modi’s rhetoric with the contention that while he landed at Kedarnath in a chopper, Rahul Gandhi had trekked 18 kms like any faithful, cut no ice because Modi’s videos have reportedly been snapped up like hot cakes in Gujarat. To do a balancing act, he promised to use a holistic approach to develop Kedarnath into a “model” pilgrim centre. Concealed in the folds of messaging was an important one meant for another state, Karnataka, that polls in early 2018. The head priest (Raval) of Kedarnath temple belongs to the Veerashaiva Lingayat community of Karnataka and chants the “mantras” in Kannada and not Sanskrit. The Veerashaiva Lingayats have demanded a religious status, independent of the Hindus, causing a problem for the Congress and the BJP. Modi may be telling the community that by heading one of the most important Hindu shrines, it is an integral part of Hinduism. Modi may not have been physically present when a lakh lamps were lit on the banks of Ayodhya’s Saryu river. But Yogi Adityanath, another “avatar” of Hindutva, presided over the jamboree laden as much with symbolism as substance for Gujarat. Think of February 2002 and the VHP-BJP’s aborted efforts to lay claim on the “disputed” land in Ayodhya to start the construction of a “grand” Ram temple. Most of the agitators were from Gujarat. Some of those who went back in a train were gutted down at the Godhra station. The unfortunate occurrence triggered a chain of violence against the Muslims who were held culpable for the train-burning and established a sense of strong religious identity among Gujarat’s Hindus. Modi never looked back since then because he owes his political supremacy to Ayodhya.